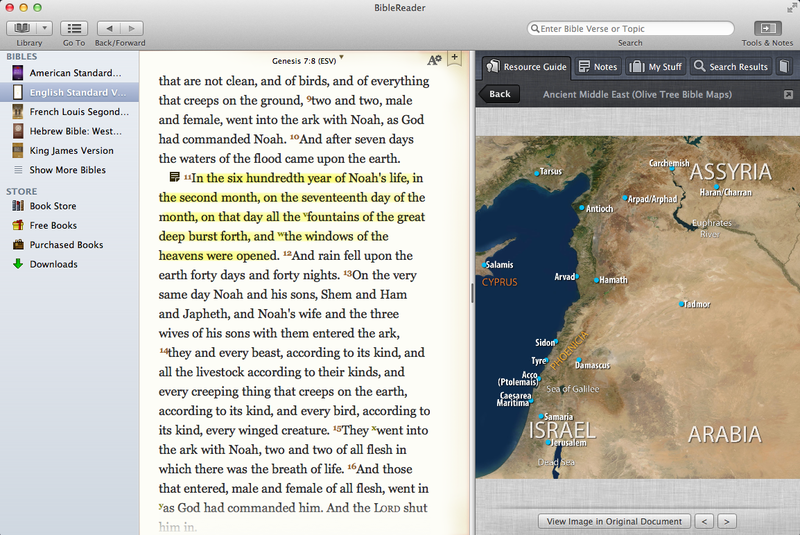 DISCLOSURE: I get a copy of ‘ESV Study Bible’ and ‘Olive Tree Bible Maps’ from OTBS. I thank the President of OTBS, Mr. Drew Haninger for the copy. It gives no obligation to write a positive review. 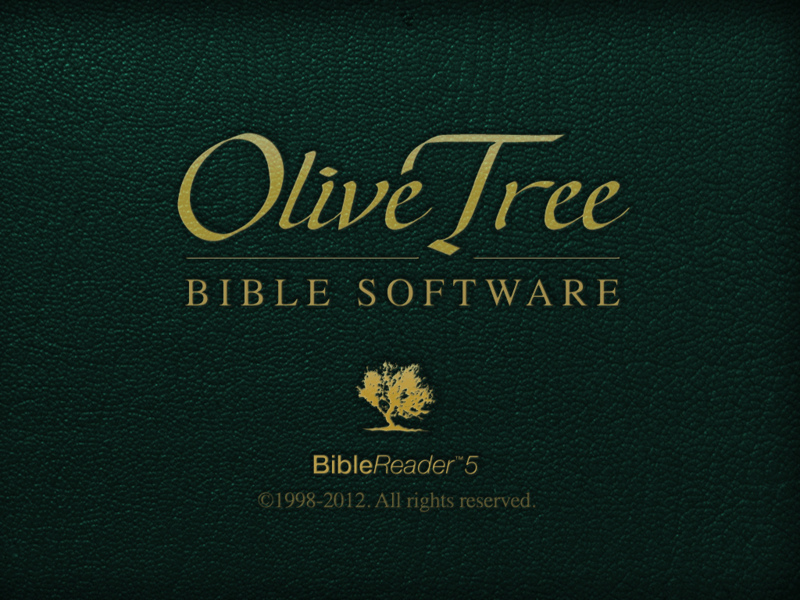 This is not the first time I am acquainted with the Olive Tree Bible Software (OTBS). I’ve heard of this software since I used my older smartphones. Yet, after using the iPad, OTBS turns to be the best bible software, way above other brands that I should not mention here. Using this software, for the first time, I am looking forward to finish the entire Bible in a year. And now, the software is also available for Mac (although upgrading it needs further struggle). In this review, I won’t be commenting about the content of the Bible, since it will be out of the topic. 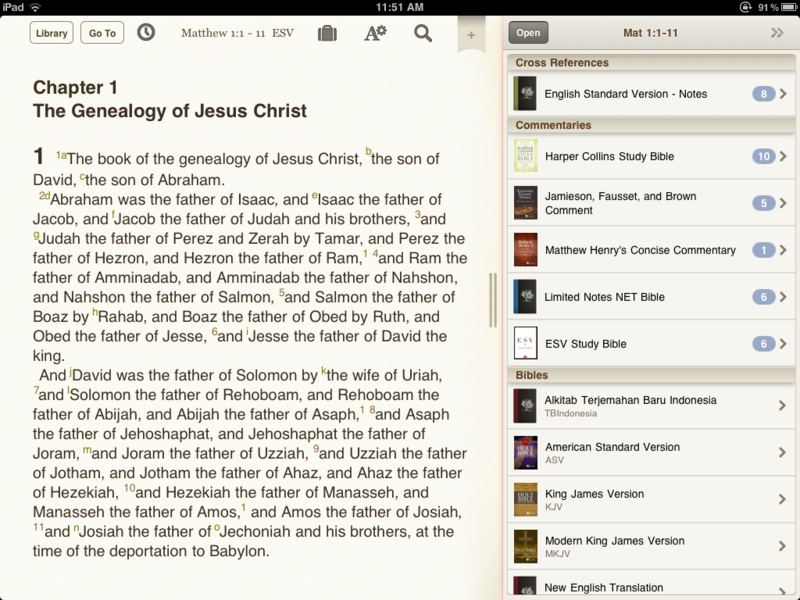 All I can say is that this software is very useful in helping me studying the Bible. I’ll focus on other areas. I am thankful that OTBS has some of the most responsive customer support, and they do hear customers feedbacks and inputs. That’s exactly what I experienced, when a number of my suggestions indeed made its way to the updates. The customer supports are notably responsive, i.e. replying customers e-mails with possible solutions to problems and other things. One of the biggest attractions to the OTBS is the user interface, which is the most beautiful compared to other similar products. It uses parchment background, gives it an elegant sense. Even so, it creates some glitches during usage, especially to my older iPad 1. Bible text with footnotes. One of my less-favorite UI features. Sometimes I feel that there should be footnotes link at the Bible text, so that when tapped, it will show pop-up window that will show the footnote. I guess it will use less number of taps compared to opening them from the resource window (split screen). Focused and unfocused. I also feel that since I am using technology, technology should help me reading the Bible in ways impossible when using the printed form. Footnotes, I think should be focused. For example, if I am looking at footnote for Matthew 1:1, the resource window should only show footnotes related to Matthew 1:1, instead of providing an endless scrollable text of all footnotes of the entire Bible. Somehow it eliminates the focus. A bit consistency. If I read the Bible text with swiping instead of scrolling, I guess the same thing should happen to the resource window. One of the maps in the ESVSB. There’s also a bug here. If I take a look at certain images in the resource guide (look at above image), and if I scroll up, the image will somehow disappear. I believe this is something workable through software updates. If there is one big problem for me on the ESVSB is that it is not seamlessly integrated with the Bible text. For example, with the ESV Bible text, I was expecting better integration with the ESVSB that makes it as if a single publication. 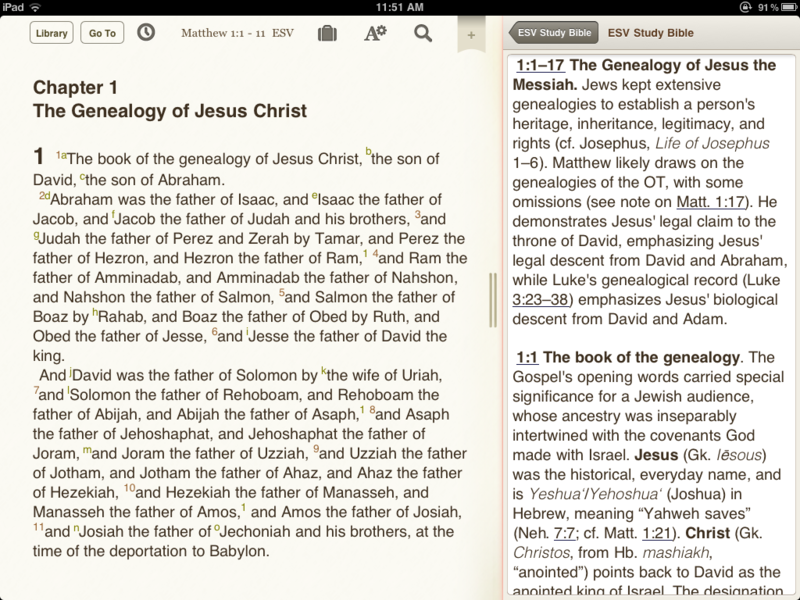 For now, I still feel that ESVSB is an anthology of biblical notes instead of an united biblical product. Now for the maps. 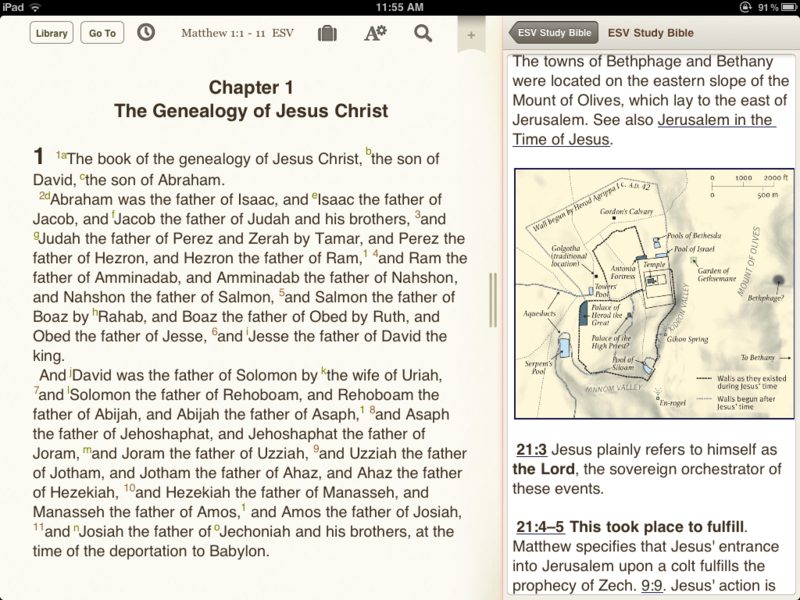 Olive Tree Bible Maps (OTBM) is a good start for a set of Bible maps. I just have one concern. I expect something more. To start, with all due respect, I feel that the maps in this product are just like sticking some labels on a Google-Earth screen capture. It is just not beautiful. I am hoping for something more, for example more colors in a specially-crafted map. It will not be necessarily a commentated map, it just need certain extra works, to make it ‘specifically, specially Olive Tree product’. OTBS on Mac OS is also beautiful. Build on a basically the same UI as the iPad product, OTBS users on the iPad won’t find it difficult to use, since the interface is 90% the same. The only unfortunate thing is that Mac OS users need to upgrade their computers to Mac OS X 10.7 Lion, which is a somewhat tough $29.99. Even tougher, it is, if the computer is a bit old (my MacBook will turn 4 this year). Luckily, in most cases, the OTBS works without any glitch. There’s a bug, however. If I open the store through the software, and I open my notes on my resource window, sometimes it will show endless windows of my note list, while the notes cannot be opened. This is quite annoying, forcing me to restart the app. Developers may want to take a look on this bug. If you ask me, which of my suggestions made it through the OTBS, is the note aggregator. 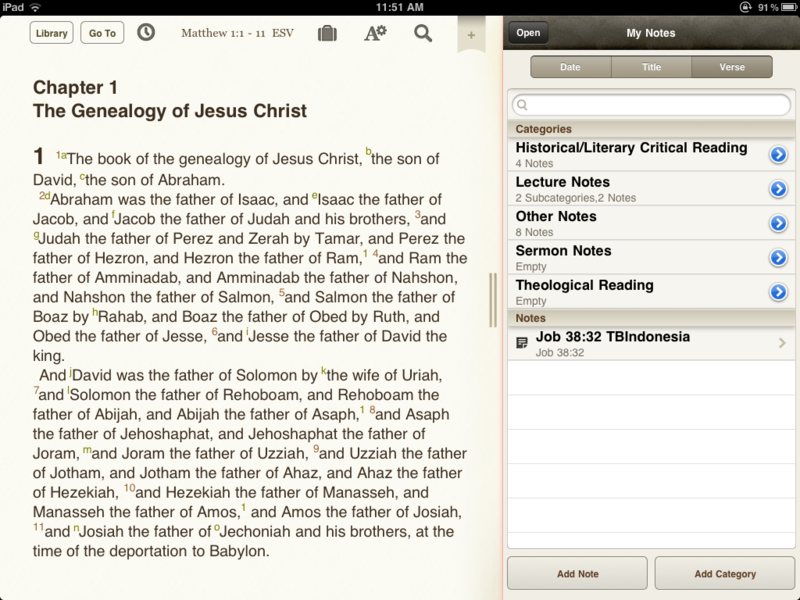 Now, you can open your notes both on the resource window and as a pop-up window through the Bible text. I find this feature 100% useful. Just a suggestion: rich-text editing and bullets and numbering support. It will be very, very nice. 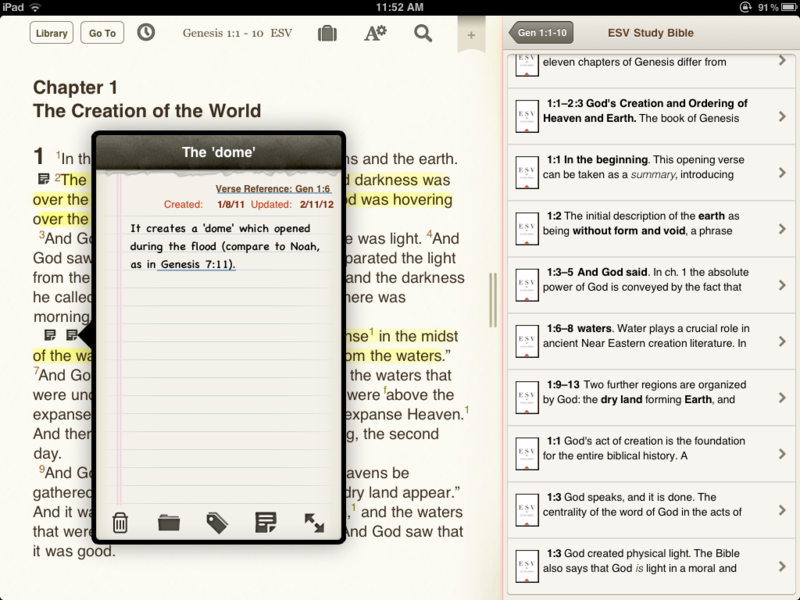 All in all, OTBS is a very strong application to aid your Bible study. No wonder, the app turns to be popular for students, laymen, and preachers alike. There are clearly things to improve, yet for now, I can find no other alternatives for this strong Bible software. Thanks OTBS for giving me a new way to read, enjoy, and learn the Bible. How to download it zel? Hmm, visit http://www.olivetree.com/ and find the device that matches yours. I believe it’s available on PC (Windows 7), Mac (Lion), iPod touch, iPhone, iPad, Android devices, and an older version for BlackBerry.